Frank M. Baily, B.Sc. LLB. & Brent A. McLean, B.Comm. LLB. licensed to practice law both in British Columbia and Ontario and is a member of the Law Society of British Columbia and the Law Society of Upper Canada. Metro Law Office LLP is conveniently located inside Metropolis at Metrotown Mall, Burnaby, British Columbia, Canada, across from the checkouts of The Real Canadian Superstore - free parking is provided below. 0ver 70 years of combined experience. 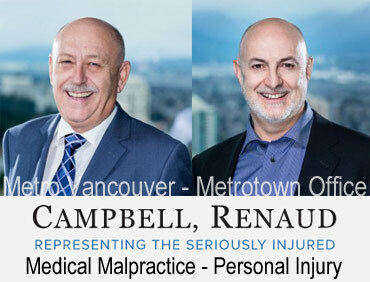 "The Burnaby-based team [Ian Campbell and Don Renaud] at Campbell, Renaud has extensive experience with a variety of medical malpractice and personal injury claims. 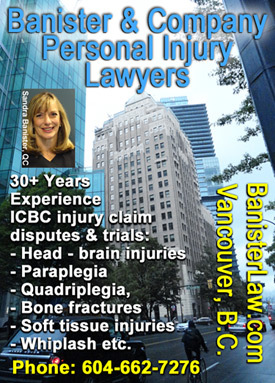 Personal Injury Lawyers & I.C.B.C. Claims Disputes: Kenneth Learn, BSc. (Hons.) LLB. ; Gordon Zenk, BA. LLB. experienced with other injuries of e.g. pedestrians, cyclists etc. Corporate-Commercial Services, Incorporations, Separation & Uncontested Divorce, Wills & Estates, Real Estate Services, Power of Attorney, Notary Services etc. Employment Disputes: representing employers and employees in wrongful dismissals, employment contracts etc. If you are looking for experienced lawyers to contest a will or contest how trustees/administrators of an estate are or are not handling their duties, not all lawyers have extensive experience in this area of civil litigation. In an era of "Do it yourself wills kits" or "Off the shelf law office forms" we suggest you interview at least 2 if not 3 lawyers first, a starting point would be lawyers who have stated to the Law Society of BC that a preferred area of practice is wills and estates, this means that at the lawyer has spent at least 20% of their time in the previous 3 years practising a particular field of law. However remember practising doesn't necessarily mean they have particular experience in court. 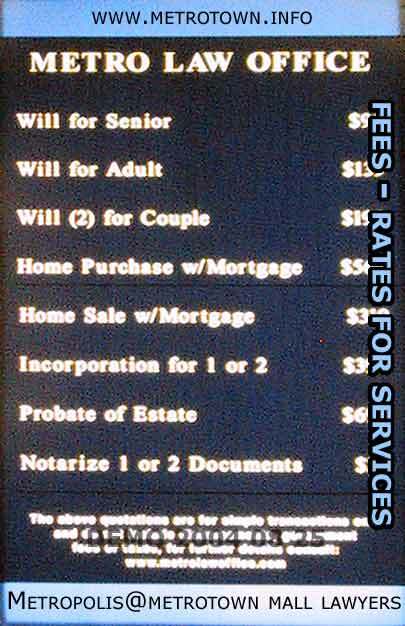 See for example the following lawyers / law firms for contested wills-estates-trusts in BC. Kenneth Learn, BSc.(hons. ), LLB and Gordon Zenk, BA, LLB. Kenneth Learn (photo to the left) and Gordon Zenk (photo below left) are experienced lawyers practising in the areas of: family law, wills, estates, and personal injury law. Initially based in Burnaby they have expanded to offices in Port Moody in 2010. 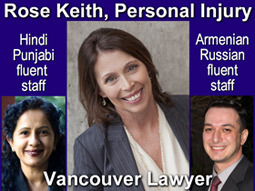 ROSE KEITH, barrister & solicitor Experienced representing individuals injured in motor vehicle accidents with a variety of injuries including brain injury, spinal cord injury, chronic pain, psychological injuries and soft tissue injuries. Focus is on ensuring full compensation for all losses suffered. Multilingual associates and staff are fluent in: English, Mandarin Chinese, Cantonese and Teo Chiu Chinese Dialects, Polish and Arabic. see more info on this well known class action lawyer " ... plaintiffs' co-counsel in British Columbia's largest class action, on behalf of the individuals infected with Hepatitis C through blood transfusions." NOTARY PUBLIC SERVICES - Vancouver, B.C. What is a "notary public"? What legal services can a notary provide? ·Offices centrally located 2 blocks from Vancouver General Hospital. 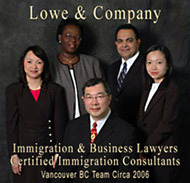 CREDITS - Metrotown.info would like to acknowledge the support of Rose Keith; Lowe and Company CanadaVisaLaw.com; and Lawyers-BC.com for their sponsorship of this section of legal services. Bruce Thompson, MA LLB, 40 years experience in complex real estate, strata, and business liability law, also wills disputes & mediation see more info. Focus is on ensuring full compensation for all losses suffered. A trial lawyer since 1982, he has experience with all aspects of motor vehicle and I.C.B.C. cases and he deals personally with his clients to ensure the best possible outcome for their claims. Hospital meetings and translation services are available. Downtown 210 - 900 Howe St.
Sandra has practiced labour law and civil litigation (with an emphasis on employment and personal injury law) for over 30 years. Born and raised in the lower mainland, Sandra graduated from law school at the University of British Columbia, and was subsequently called to the British Columbia bar in 1982, after completing a clerkship with the British Columbia Supreme Court. "When you are injured, you want an experienced lawyer to help guide you through the insurance claim process and to ensure you receive the compensation you deserve. We have decades of experience with ICBC and have successfully resolved all types of personal injury claims, from brain or spinal chord injuries to soft tissue injuries. We will help demystify what can be a very confusing time and will ensure that your rights are protected as we navigate the claims process. She represents individuals injured in motor vehicle accidents with a variety of injuries including brain injury, spinal cord injury, chronic pain, psychological injuries and soft tissue injuries. Focus is on ensuring full compensation for all losses suffered.